There are a number of traditional Christmas drinks, but in recent years people have gotten very creative. Some people have created Christmas cocktails from scratch, while others have added Christmas twists to existing drink recipes. This is a collection of festive Christmas drinks designed to make your holiday more fun and delicious. These drinks are creative and beautiful. They range from rich and creamy to light and refreshing, so there’s something here for every palate. If you’re looking for Christmas gifts for cocktail lovers, check out our Cocktail Gifts Guide for ideas! 1. The Chocolate Peppermint Stick uses white creme de cacao and peppermint schnapps to get a mint chocolate flavor. There’s also a hint of berry from that lovely grenadine “sunrise” in the bottom of the glass. This is one beautiful cocktail to present to guests at a party… or just to enjoy on your own. 2. 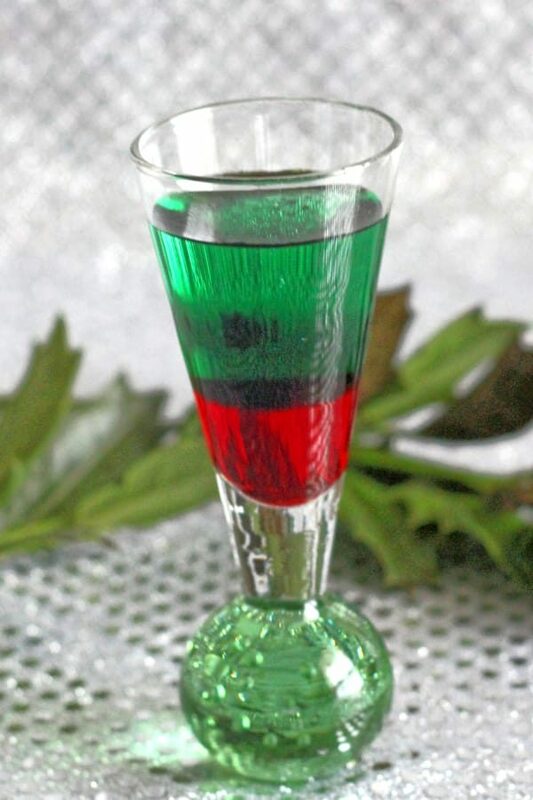 The Santa Shot layers peppermint schnapps, grenadine and green creme de menthe for a beautiful little shot of Christmas spirit. It’s low alcohol with an easygoing mint and berry flavor. That makes it a great choice for parties. You can make a tray of shots in advance and keep them on a tray in the refrigerator. Layering cocktails is easier than you think – check out my video tutorial! 3. 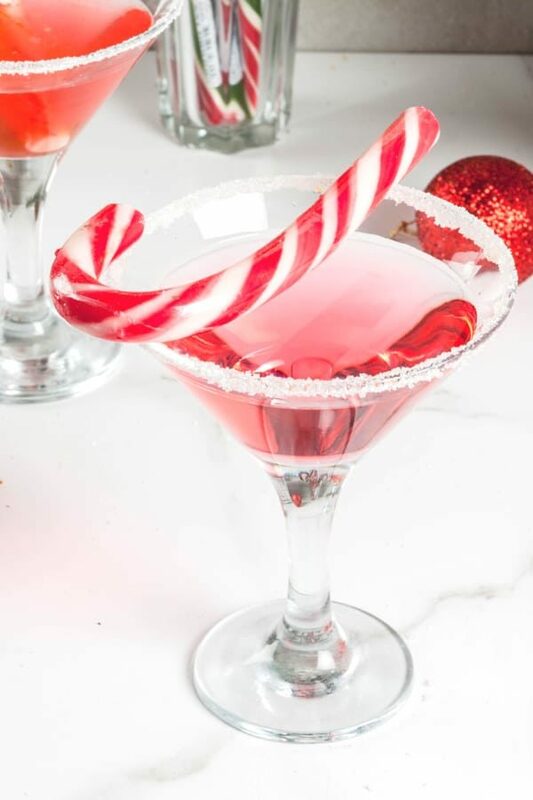 The Candy Cane Martini blends the flavor of peppermint with a hint of raspberry to make it taste like a delicious candy cane. And it really is delicious, with that light Chambord instead of a heavy grenadine syrup. This cocktail is easy to serve one by one or in premixed pitchers. 4. 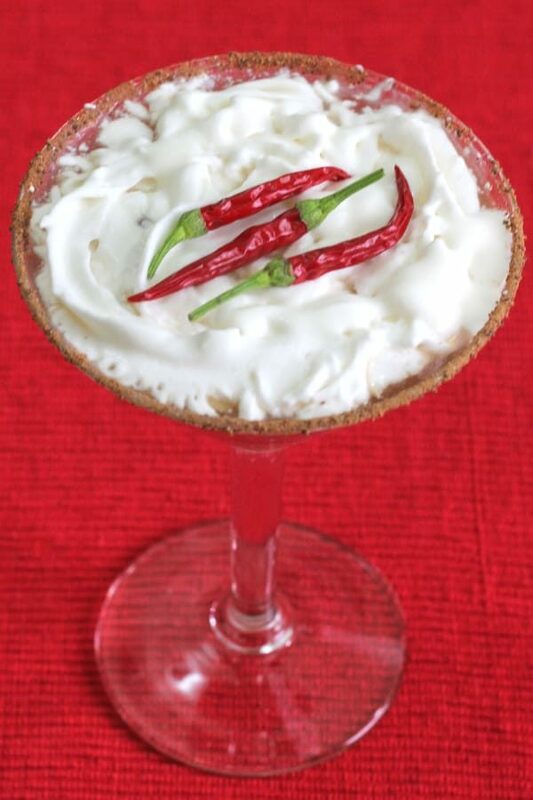 The Red Hot Santa Tini uses chili-pepper infused vodka and a rim that’s cocoa powder mixed with cayenne. It’s not your typical Christmas fare, and it really is a little bit spicy, which makes it so different and special. You can get the little dried peppers for this one here. 5. The Very Cherry Christmas blends cherry vodka with chocolate liqueur and Irish cream to create a creamy drink that’s rich and satisfying. It tastes like a chocolate covered cherry, and it looks like a million bucks. 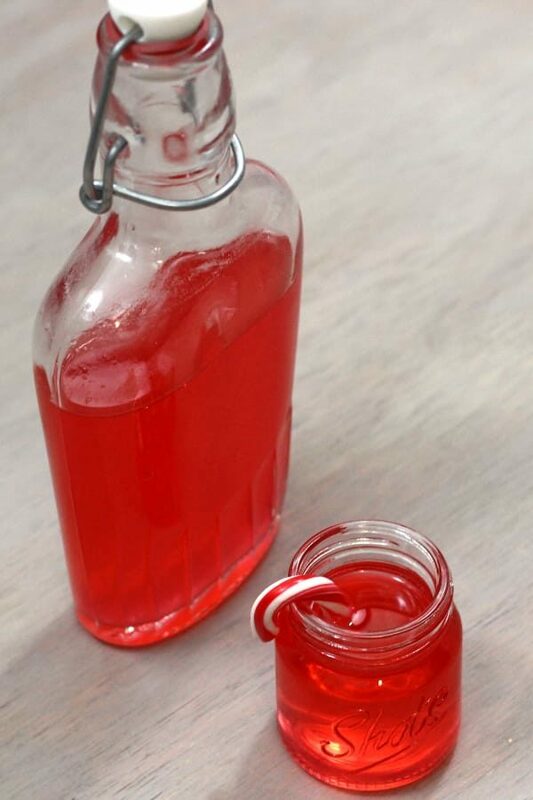 You can upgrade it by using Luxardo cherries or Woodford Reserve Bourbon Cherries instead of the standard heavy syrup packed ones from the grocery store. 6. 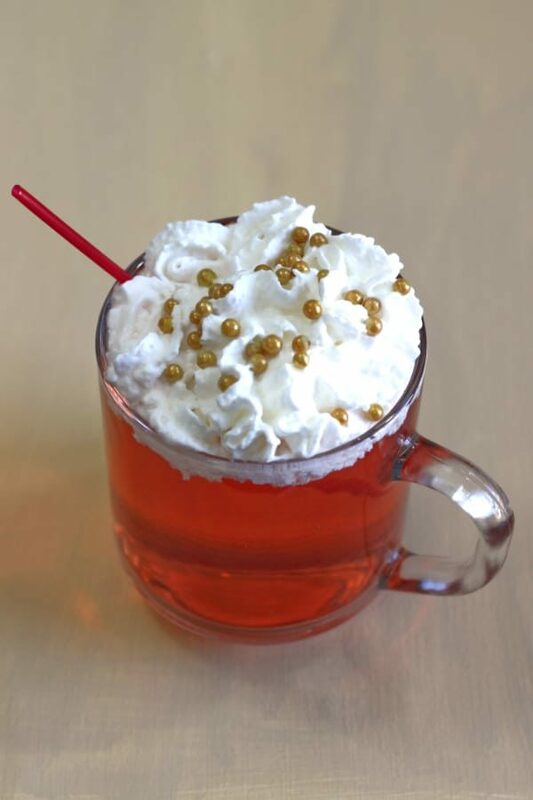 The Red Rudolph is a warm drink that features cinnamon schnapps with the flavors of orange and cranberry. There’s also some vodka to give it a little kick. It gets topped with whipped cream (optionally, of course). It’s a wonderful blend of fall flavors that’s perfect for chilly evenings and snow days. 7. 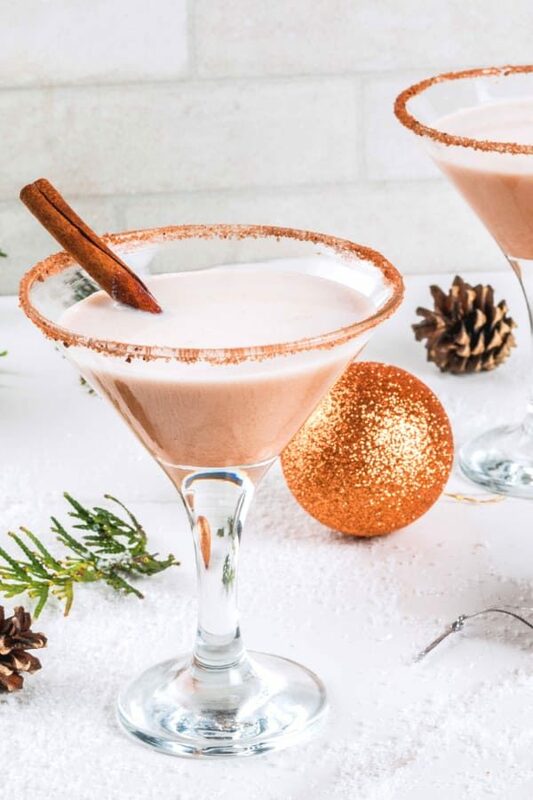 The Reindeer Tracks Martini blends chocolate vodka with Frangelico, creme de cacao and more. The rim is made from crushed Oreos, and the whole drink is just fantastic tasting. It’s all chocolate and hazelnut, with wonderful texture from the crushed cookie rim. And it turns out cookie crushing is a great way to relieve holiday stress. 8. 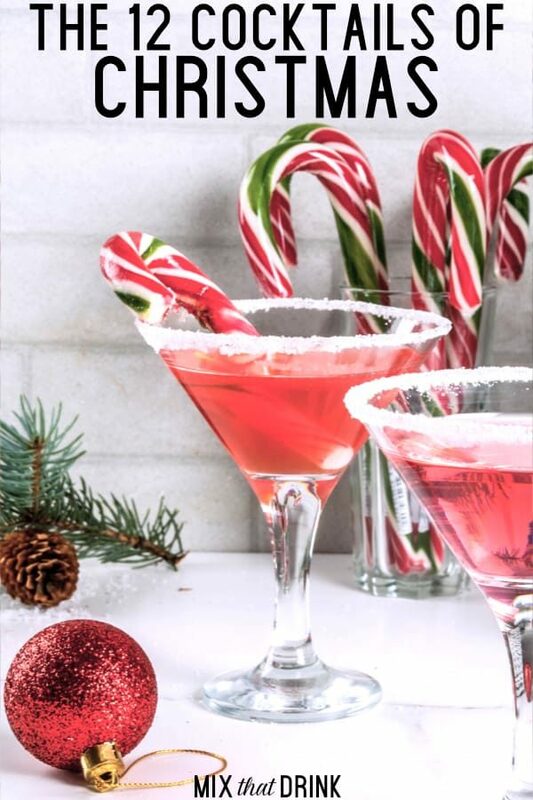 The Candy Cane blends peppermint schnapps with berry vodka and creme de cacao to make a delicious cocktail that tastes like mint with hints of berry and chocolate. It’s definitely on the sweet side and a little bit creamy, too, thanks to the addition of some half-n-half. 9. 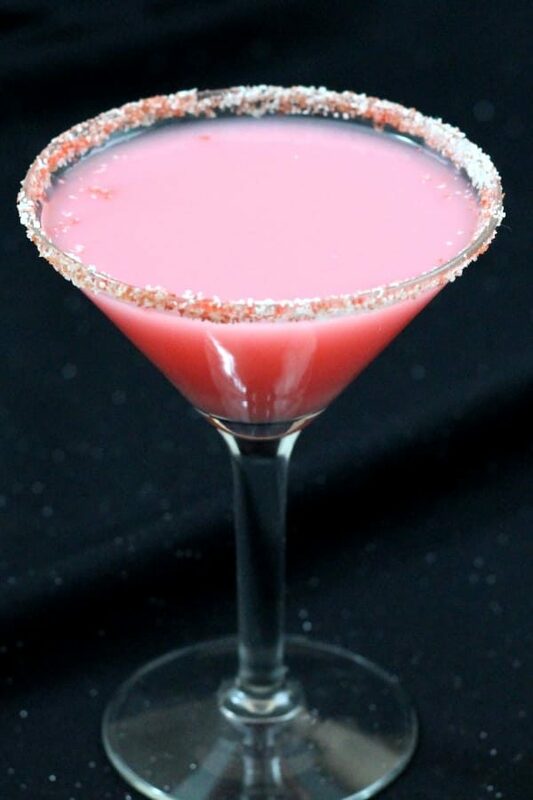 The Mistletoe Martini is a light, refreshing choice for a Christmas cocktail. It blends cranberry juice with vodka and elderflower liqueur, and you garnish it with real cranberries and mint leaves. The cranberries just pop in your mouth when you eat them, which makes it so much fun. 10. 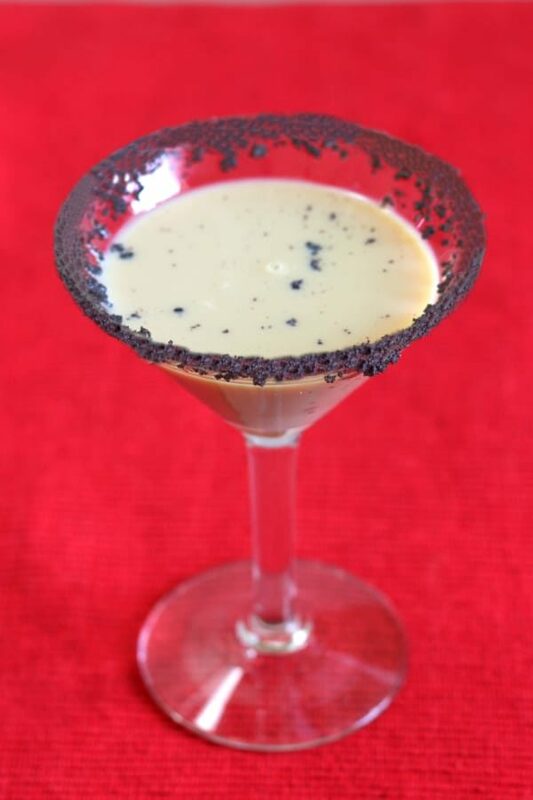 The Christmas Cookie blends the commonly paired Kahlua and Baileys with an unexpected shot of peppermint schnapps. The flavor is mocha, caramel and mint, and it will surprise you. It’s rich and sweet and so comforting to drink by a nice fire. It also makes a great dessert drink. 11. The Eggnog Martini is a great alternative to the traditional Eggnog. It includes a little bit of real eggnog, but lightens it up with the addition of vodka and amaretto. The result is a less heavy, more refreshing cocktail that still has that eggnog taste and feel. This one makes a great dessert drink. 12. Had enough of the holidays already? 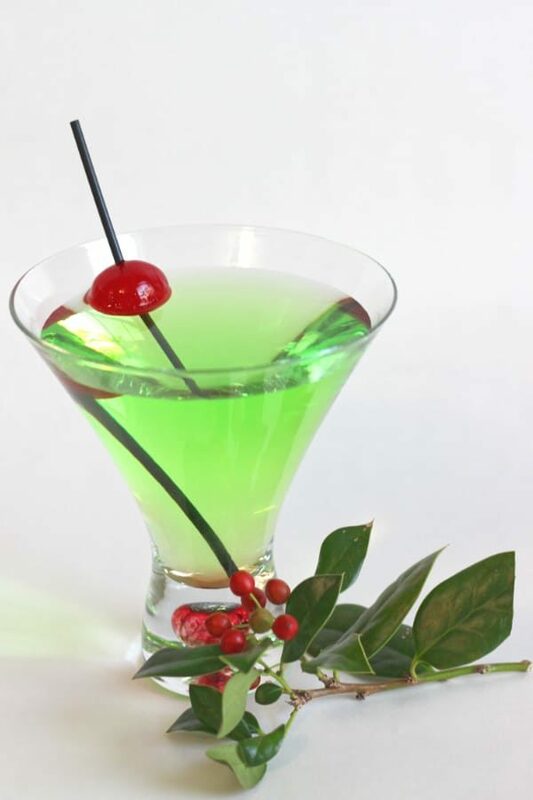 Have a Grinch cocktail and feel better. Lemon juice cuts the sweetness of Midori to give you a nice, refreshing sweet and tart treat of a drink. This drink is light on the alcohol, which makes it a great little pick-me-up whenever you most need one. It’s not exactly “cocktails” and certainly not traditional, but you can make Skittles Vodka, Jolly Rancher Vodka or Vodka Gummy Bears in red and green. Both Skittles Vodka and Jolly Rancher Vodka can be used as mixers in other cocktails. 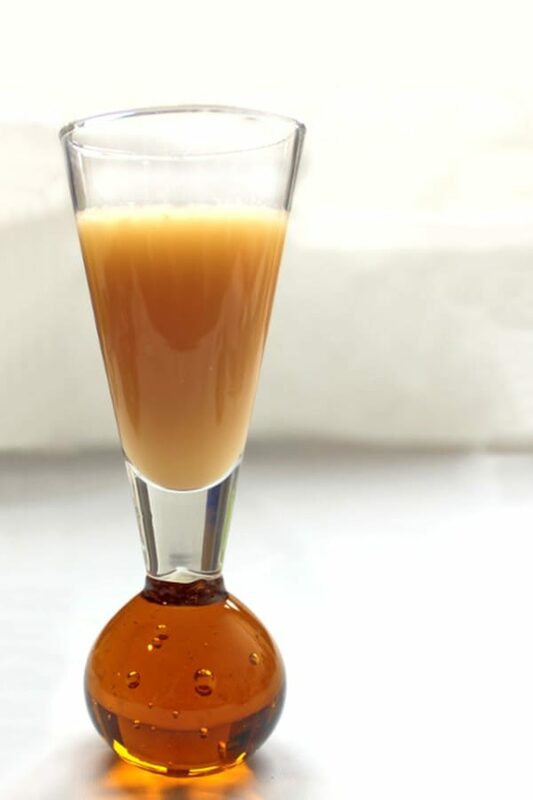 Salted Caramel Vodka is also delicious, with a flavor that seems just right for the holidays. You can make it quickly and easily, and serve it alone or in cocktails. It has a wonderful texture because it’s made from actual caramel candies. 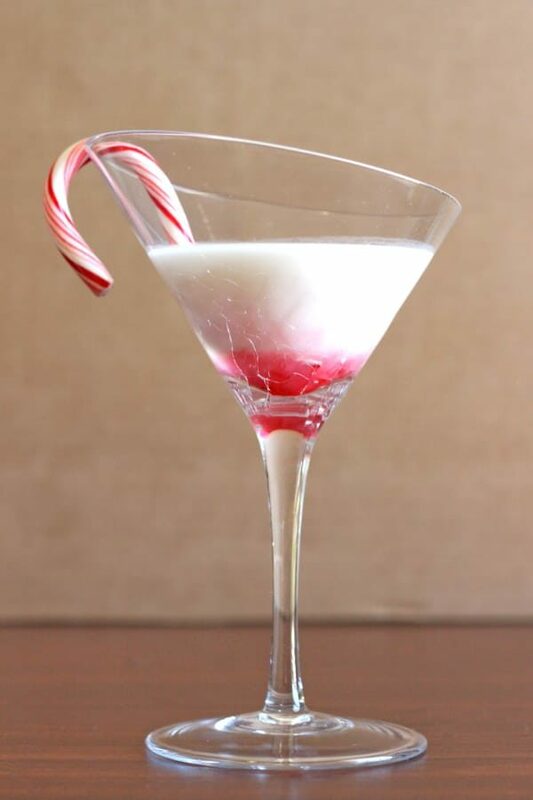 Or you can make the delicious and extremely simple Candy Cane Infused Vodka, which has a bright, sweet, minty flavor. It’s made from candy canes, and you have to crush them. Turns out that’s a very good way to relieve some holiday stress! And if you or and of your guests aren’t drinking, check out our collection of mocktails and non-alcoholic cocktails. They’re just as beautiful and tasty as regular drinks, but without the alcohol. One that might make a nice alternative on the list is a carrot cake. It really does taste just like carrot cake! A few of the recipes mentioned that some of the techniques (like crushing cookies) will relieve holiday stess. My only stress with these awesome recipes is that I won’t have enough time to make and enjoy them!! !